The global expansion of businesses has made it imperative for organizations to have a micro level visibility of their inventory along with efficient inventory receiving and put-away and optimization of picking and shipping of orders. The changing dynamics of customer requirements have driven companies towards focusing on mass personalization instead of mass production. This in turn translates into large varieties of inventory at the warehouse leading to complexities in storage and goods receipt/issue. The traceability of inventory, handling large volumes of Sales/ Purchase orders having individual requisition of small quantities and managing of “Mini-Warehouse zones” are the primary challenges.The situation becomes further complicated when we look at this in the context of a 2 Tier ERP architecture between the Headquarter and the Subsidiary. The inventory is owned by two different entities on two different ERP instances. The visibility of inventory right up to the bin level is of utmost importance before creating a Purchase Order for a Supplier or confirming a Sales Order to a Customer. The convergence of Information Technology with Operational Technology (IT-OT) is the foremost driving force in driving an organization towards process excellence in a Digital Economy. When we talk about Warehousing Operations in the context of 2 Tier ERP architecture, we need to recognize another major stakeholder. The concentration of organizations towards managing their core competencies has also resulted in introduction of 3rd Party Logistics (3PL) Providers for managing warehousing operations. These 3PLs are emerging as global players in managing the Warehouses on behalf of large companies. In a 2 Tier ERP environment, a significant importance has to be provided to these 3 PLs. The 3PLs usually own a Warehouse Management System (WMS). Hence, we find ourselves in a scenario whereby the Headquarters run on an On-Premise system which can be SAP S/4 HANA or SAP ECC or any other ERP system, the Subsidiary run on SAP S/4 HANA Cloud and the 3PL (if involved) running on a WMS which can be On-Premise or On-Cloud. As of SAP S/4 HANA Cloud release 1708, SAP has provided pre-packaged integration of SAP S/4 HANA Cloud with any other 3rd Party Warehouse Management System. 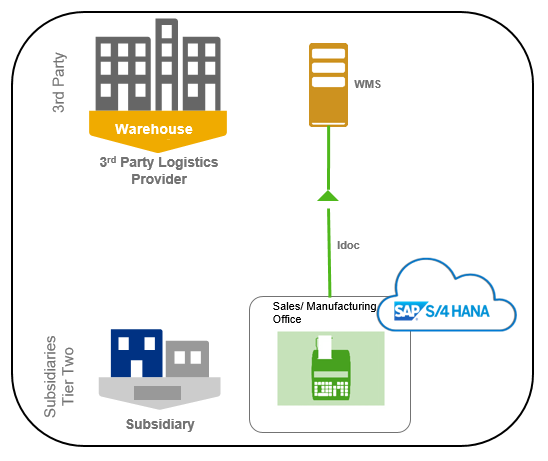 At present the Sales and Procurement processes are covered whereby Idocs are used to communicate between the SAP S/4 HANA Cloud and external Warehouse Management System (WMS). In case of Procurement process, SAP provides a pre-packaged content whereby Idocs are used to replicate Inbound delivery created in SAP S/4 HANA Cloud to Warehouse Management System (WMS). 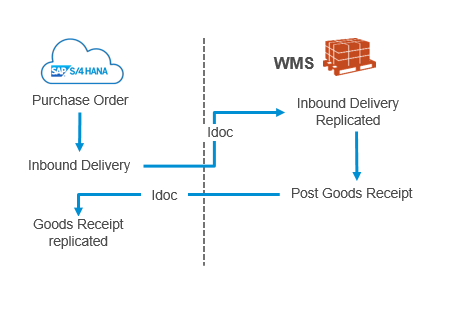 Consequently, the Goods Receipt against Purchase Order in the WMS is replicated using Idoc into the SAP S/4 HANA Cloud. 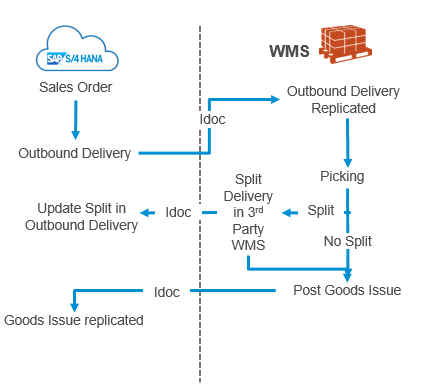 For the Sales process, the Outbound delivery in the SAP S/4 HANA Cloud is replicated into the WMS. Subsequently, in the WMS Picking is carried out. If the Delivery is split then the same is replicated in the SAP S/4 HANA Cloud. 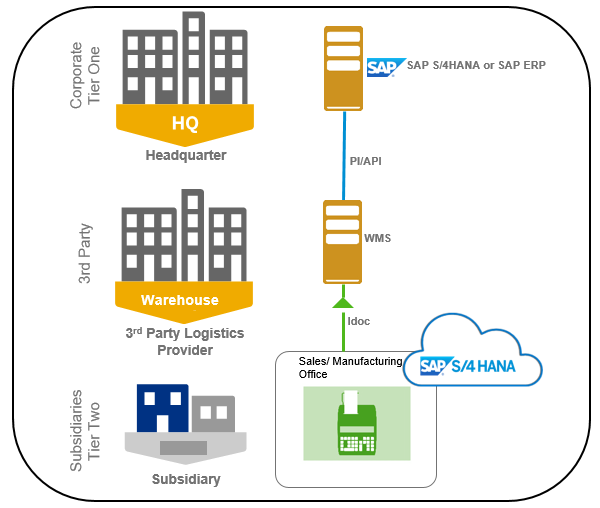 After that Goods Issue is posted in the WMS and the same is replicated in SAP S/4 HANA Cloud. Next look at the business cases for Warehouse Management in the context of 2 Tier ERP Architecture. The headquarter runs on SAP ERP (ECC)/ SAP S/4 HANA On-Premise with a central Warehouse Management System owned by the headquarter. The Warehouse Management operations are carried out by the headquarter itself. 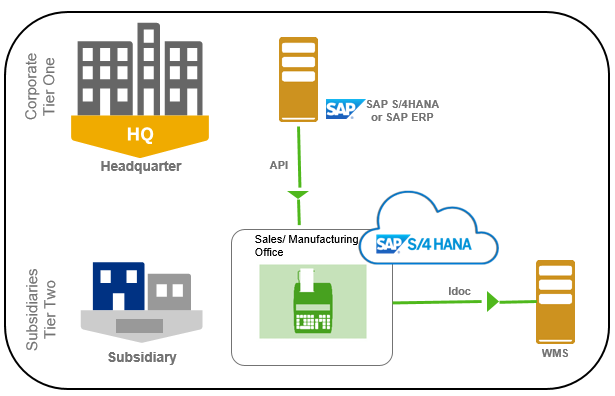 The subsidiary is a local sales office running on SAP S/4 HANA Cloud, which checks the availability of inventory at the Headquarter before confirming any order to a customer. Here, the Subsidiary’s SAP S/4 HANA Cloud is integrated with the Headquarter’s ERP. **As of SAP S/4 HANA Cloud 1708 Release, this scenario is not yet realizable. In this case, the warehousing operations of the Headquarter and all the subsidiaries are managed by centrally by a 3rd Party Logistics (3PL) Provider. The Headquarter can run on SAP ERP (ECC)/ SAP S/4 HANA On-Premise and the subsidiary runs on SAP S/4 HANA Cloud. The ownership of the Warehouse Management System (WMS) is with the 3PL. The subsidiary in this case can be a Sales/ Manufacturing organization. The request for Inbound/ Outbound delivery is sent by the headquarter and subsidiary to the 3PL. The 3PL carries out the warehousing operations and conveys the Goods Issue/ Receipt details to headquarter/subsidiary. This a 2 Tier scenario between the 3PL and the Subsidiary. This is common in cases where the subsidiary’s line of business is very different from the headquarter. The subsidiary has its own Sales/Manufacturing operations with the Warehousing activities being managed by a 3PL. The subsidiary runs on SAP S/4 HANA Cloud and the Warehouse Management System (WMS) is owned and managed by the 3PL. The request for Inbound/ Outbound delivery is sent from the subsidiary to the 3PL. The 3PL carries out the warehousing operations and conveys the Goods Issue/ Receipt details to the subsidiary. Again, this is common in cases where the subsidiary’s line of business is very different from the headquarter. The subsidiary manages its own warehousing operations. The subsidiary runs on SAP S/4 HANA Cloud and owns the Warehouse Management System (WMS) as well, which can be On-Premise or on Cloud. 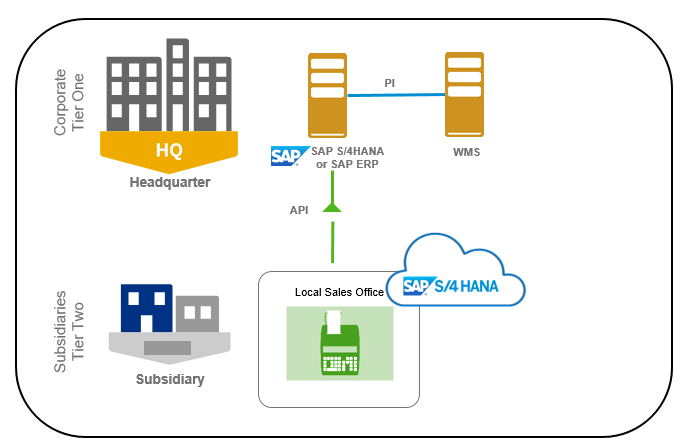 The headquarter can run on SAP ERP (ECC)/ SAP S/4 HANA Cloud. The headquarter just needs visibility on certain basic aspects about the subsidiary and has no interaction with the subsidiary’s WMS.